Prominent & Leading Exporter from Rajkot, we offer pvc air hose, column pipe, pvc suction hose, pvc braided hose, pvc duct hose and pvc welding hose. 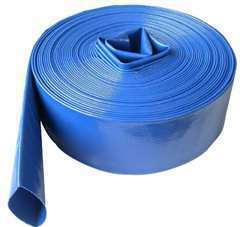 PVC Air/Pneumatic hose is a multi-purpose hose, which can be used for air compressors, heavy duty water suction and delivery, conveying chemicals and gases. 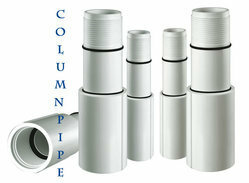 UPVC Column Pipes for submersible pumps are designed on latest technology, crafted on the most sophisticated equipment to deliver the desired performance, meeting the challenges of tough long duty cycle of 50 years with an unmatched success rate, yet being the most cost effective option. Manufactured using the best quality raw material, threaded and thread sealed UPVC Column Pipe stand to meet the heavy handling yet are very easy to install. 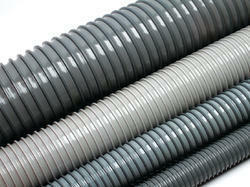 PVC Suction hoses are used in agriculture. They are used for transferring water from wells, dams, tanks to fields. They come in different sizes from 2" to 8". 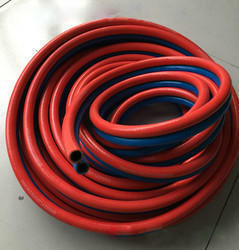 PVC Braided hose is used for agricultural as well as domestic use. It is used for watering of plants in fields or in houses. Ideal for Light Duty collection conveying of Air, Gases, Dust and Light materials. Used for conduits of air, industrial ventilation, collecting dust with exhaust fans in stone masoning, fiberglass, textiles, asbestos processing and other industries, cooling of motors and air intakes for all machineries, conveying warm air for drying, vacuum cleaning equipments, air-conditions for offices, kitchen-range overhead exhaust, etc. Suitable for oxy-acetylene welding and cutting equipments in all types of industrial workshops, oil refineries, steel mills, ship building repair breaking yards, service stations, garages etc. Separate colours for easy identification. 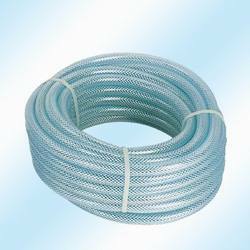 PVC steel wire hose or thunder hose is transparent and embedded with spiral steel wire inside soft pvc body for extra strength and anti static purpose. It is non-toxic, food grade hose. 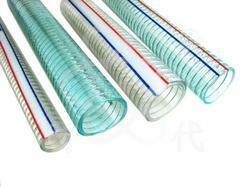 PVC Flat Hose is a superior replacement to conventional cotton/kisan/Lapeta hose pipes. It is the first and only product made in India of this kind. Composition : The hose is composed of flexible PVC with synthetic yarn reinforcement to provide extra strength.